Looking to protect yourself from fraud, identity theft, and scams? This week, March 4-10, is National Consumer Protection Week, when we join the Federal Trade Commission (FTC) to help consumers understand their rights and make well-informed decisions about money. Have questions about how to protect your hard-earned money? You can join us today at 11:00 a.m. EST on Facebook for a special edition of Social Security Live, with Lisa Schifferle of the FTC. We’ll be discussing consumer protection tips, including how to protect yourself and your loved ones from scammers. Don’t miss this opportunity to hear from the experts how to protect what’s important to you! 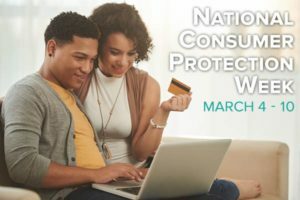 You can visit the National Consumer Protection Week website here to read recent scam alerts and learn about a variety of topics, like privacy, identity, online security, and more. Social Security has a robust cyber-security program to help us protect the information and resources entrusted to us. You can help secure your information by opening a personal my Social Security account. We’ll continue to do our part to protect what’s important to you and share information on how to protect yourself all year-round. Don’t forget to RSVP to our special Facebook Live event today! This entry was posted in Fraud, Privacy & Identity and tagged Federal Trade Commission, fraud, FTC, identity fraud, Identity theft, National Consumer Protection Week, NCPW, online security, privacy, Scam Alert, scammers by Jim Borland, Acting Deputy Commissioner for Communications. Bookmark the permalink. So when will the government stop using my social security number to be shared with the medical network and compromise my identity? That’s already happened. SS is transitioning over the SSN used on Medicare cards to a unique #. call their toll free # for further details, 1800-7721213. New Medicare cards are coming, visit http://www.medicare.gov for more information. This online stuff all looks fancy, but where is our consumer protection agency on the ground? Couldn’t find you when crooked banks stole my home, can’t find you now when my storage provider calls a 14 foot unit a 16 foot and charges 3 or 400 people in the complex the same way. There’s really nobody out there doing the job as far as we can tell. Yep, SSA is really concerned about your storage locker. Post somewhere on a site that cares about your petty problems. Since my SSI CHECK WAS STOP BY SOCIAL SECURITY ADMINISTRATION. NEXT WEEK ON MARCH 13,2018 IS MY BIRTHDAY 64 YEARS OLD I AM BORN 1954–2018.AND 32 YEARS IN THIS COUNTRY BUT I HAVE HOPE.WE THE PEOPLE.OPINION IS MATTERS. Why don’t you tell us why your SSI welfare payment stopped? Was it for a security reason? If not, why the beef on this site? I wrote a question regarding my social security on one of your website’s and entered my social security number to help you find my account and it ended up being published on your blog. I could not erase it. I do not how to erase it. Why would you do such a thing? Never give out your SSN to anyone except an employer or someone who has a valid reason to have it. Never put it on a public site. I am naver give for any program of my password of email for subscriber program! NC has financial problems, Is not a enough that the money I’m receiving from the Government is being paid back into local economy in NC, They want more. NC know that I have a subsidy from the Government having low income , Not having any credit, Working for low paying jobs, I hope that the SSA will protect me having the option to move out of NC, To do better financially. SS does not care where you live unless it is a barred country such as Iran or N Korea. Check with them if you plan on living in a hell hole. PHONE that was STOLEN by a person in a wheel chair! money with IDENTITY THEFT PROBLEMS ! Hello Jose! To learn more about the steps individuals can take to prevent or resolve issues of identity theft, read our publication: “Identity Theft and Your Social Security Number”. We hope this helps. The individual with the the moniker, AKA, seems to be a troll, accosting the others making sincere posts. I don’t want Facebook leaving notifications in my email or When I am playing a game or when I am on the phone. I think is very controlling, rude, invasive, forceful and they like Russia invading our country and changing the outcome of the presidential elections. You can join us today at 11:00 a.m. EST on Facebook for a special edition of Social Security Live, with Lisa Schifferle of the FTC. Please advise as to how I can see the special edition of Social Security. This is of great help for all of us to be aware of what is all about our Social Security and the right thing to do in case we are a victim of fraud. I just received a letter from IRS informing me that I am a victim of Employment Related Identity Theft Notice. I tried to contact the three Credit Bureaus but still not able to talk them coz they keep on telling me that there is a lot of callers ahead of me. I need your help to inform the Social Security office informing them that I am a victim of Identity theft. Generally, reports and investigations of identity theft are handled by the Federal Trade Commission. You can find more information from their website: http://www.idtheft.gov. Or you may call them at 1-877-IDTHEFT (1-877-438-4338). how can I check my deceased Father & Husbands SS#s to be sure no one is using them ? problem is i couldn’t distinguish between letters and. numbers or upper or lower case. I have visited the office in Idaho Falls and also talked to them on the phone. My husband passed away on Dec 3 2017 and they assured me that they would take care of getting the SSA payment changed so that I would get my husbands amount. Is someone else getting my money or are they very slow? We are very sorry to hear of your loss, Elaine. We apologize for the wait. We have referred your inquiry to our Operations staff for a follow up and to take corrective action as necessary. We appreciate your feedback, and thank you for bringing this to our attention. Hi Tamika. Generally, reports and investigations of identity theft are handled by the Federal Trade Commission, you can find more information in their website: http://www.idtheft.gov or by calling 1-877-IDTHEFT (1-877-438-4338). Can someone, please tell me why does Social Security Administration are putting “minors” social security number on the pages when sending out mail? My child is 3 years old and every piece of mail I get from the SS office has his social on all the pages. That is how fraud is committed. I can see putting his last four digits on the paper work but I really feel that something needs to be done. This is how senior citizens information is getting stolen also. Someone needs to come up with a different way to identify people. Keep in mind that when a child is under age 18, not married, and lives at home with his or her parent(s), we may consider a portion of the parents’ income and resources as if they were available to the child. We call this process “deeming.” We make deductions from deemed income for parents and for other children living in the home. After we subtract these deductions, we use the remaining amount to decide if the child meets the SSI income and resource requirements for a monthly benefit. See “Understanding Supplemental Security Income SSI for Children” for more information. Please call our toll free number at 1-800-772-1213 for assistance. One of our agents should be able to provide you with an explanation. Representatives are available Monday through Friday, between 7 a.m. and 7 p.m. Generally, you will have a shorter wait time if you call later during the day or later in the week. Thanks. How is the SSA operating without a commissioner? Hello David, Ms. Nancy Berryhill will continue to lead the agency from her position of record, Deputy Commissioner of Operations, to ensure that agency operations continue uninterrupted and that there is no impact in our service to the American public. Thanks! Hello Jason, you can learn about recent “Scam Alerts” in the FEDERAL TRADE COMMISSION website. Thanks! Hi Mary. Generally, reports and investigations of identity theft are handled by the Federal Trade Commission. You can find more information from their website: http://www.idtheft.gov. Or you may call them at 1-877-IDTHEFT (1-877-438-4338). i have filed a fraud case on my account but its been a year and nothing has been done, i have been to my local SS office 2 times, i was told that the money was mine and i should go get it, i was even given the account # of Blue Dot Bank where they sent 2 payments. but no one will clear my record. I am 66 in july and even though i won’t retire until 70 I WANT THIS CLEARED UP. my SS online account was taken over by a person who stole all my info, she actually became me! I was denied to login to my own account, made herself my care surrogate…she did this on everything I have….I am well aware of this as is Microsoft and a special co. that deals with these crimes, she quickly changed it all back, but too late, charges being investigated. I’m going to be changing banks soon. How do I make sure my checks are transferred from one bank to the other? Hi Charlene, you can start or update your direct deposit information by using your personal my Social Security account. Thanks!